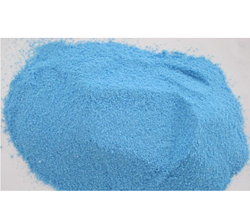 Leading Manufacturer of copper edta from Panoli INA. With a consistent focus on quality, our company is engaged in offering a quality assured grade of Copper EDTA. The offered copper EDTA is applicable in foliage fertilizers, trickle irrigation and absorbed in NPK. Our offered copper EDTA is precisely processed using the finest quality chemical compounds and modern technology under the strict supervision of our experienced professionals. Apart from this, provided copper EDTA can be availed from us at market leading price. Looking for Copper EDTA ?